DO YOU KNOW YOUR PROPERTY'S ZONING? Zoning is the primary factor driving the potential of a piece of real estate. The type of use, height limits, density specifications, parking requirements, etc. all drive the potential use of a parcel. Scoutred organizes zoning details on millions of parcels and visualizes the data so you can make informed decisions about the potential value of your real estate. The high level due diligence research that use to take you days will now takes seconds. A professional report that can be shared with confidence. 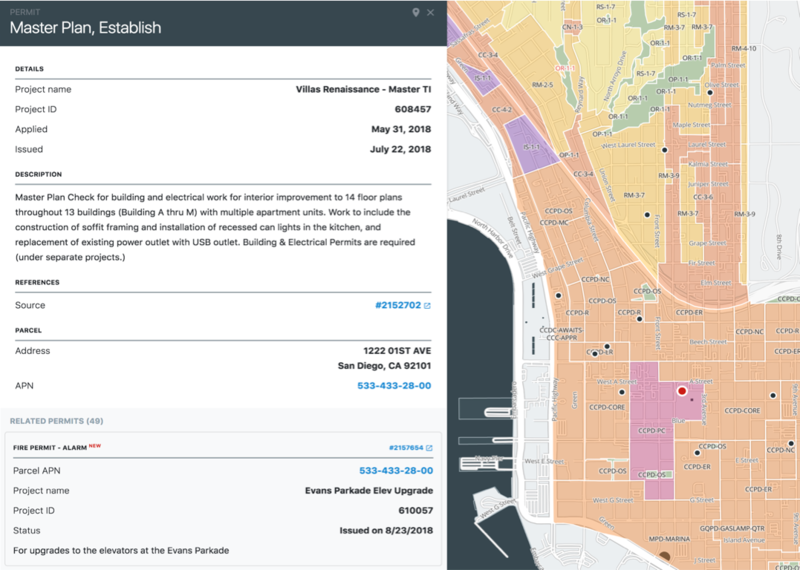 Permit data is a leading indicator of what's developing within a municipality and Scoutred makes it easy to query hundreds of thousands of permits. Query the permit scope by keyword. Get creative querying the easiest and most robust permit search available. Records are added weekly and you will be surprised what you find. With Scoutred you can inspect water and sewer main infrastructure, down to the individual lateral. No more digging through GIS files looking for specific attributes for plan submissions. What a novel idea. 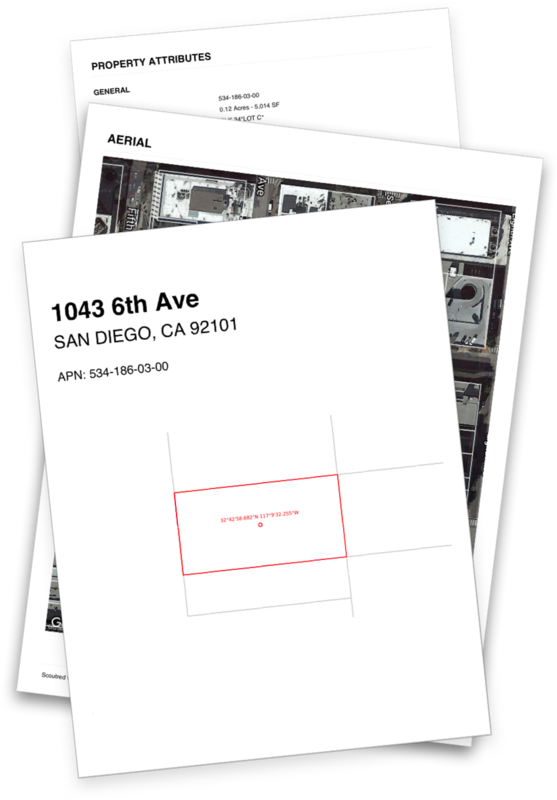 Quickly extract parcel lot lines for use in industry leading design software like AutoCAD (DXF) and Google Maps (KML). Extract parcel data for use in spreadsheet programs like Microsoft Excel and Google Sheets or generate a client ready PDF property report. We pull all data directly from the authority and update regularly. We avoid using any data intermediaries so we can provide you the most accurate and up to date information. Scoutred covers San Diego County and Los Angeles County. Additional counties coming soon.